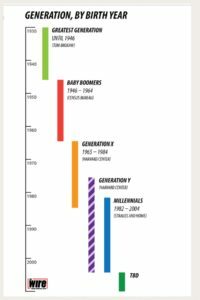 I relate to the characteristics identified in a new ‘micro generation’ the Xennial. What is an Xennial? 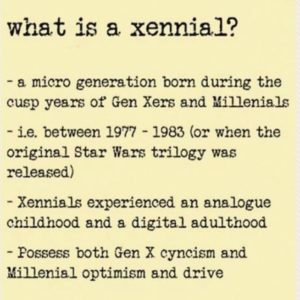 Xennials are a recently identified ‘micro generation’ sitting between Gen Xer’s and Millennials, hence: Xennials. Xennials overlap with Gen Xer’s, Gen Y and Millennials. Generations are defined by age, geography, shared resources, shared experiences and similar use of tools or technology. These attributes identify the cultural knowledge and qualities of a ‘Generation’. The Xennials are unique from Millennials and Gen Xers and have been said to be “The lucky ones” with the most varied experiences in technology AND tend to have an entrepreneurial spirit. Xennials were the first generation to grow up with household computers and have internet access! Xennials are active on social media, though they grew up without Facebook, Twitter or MySpace. Many Xennials didn’t get their first cellphone until their late teens or early twenties and are familiar with calling friends on land lines. The New York Times ran a piece on the dreaded “Class of 2001” who were Xennials just leaving University or College with huge student debt an few prospects for jobs. Xennials also witnessed the financial collapse of 2008, young in their careers. It has been said that they were hit hardest by these collapses as the economy tanked just as they were finding jobs or starting their careers. 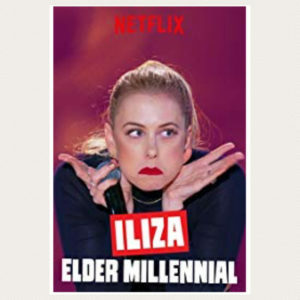 The average Millennial would have been 18 years old during the financial crisis, whereas the Xennial would have been 28 years old or so – completely different experiences. That’s all for now, Have a great weekend! Please sign up for my newsletter here to receive exclusive content!